Magnifier lamp GAMMA 3D, buy at the price of 111 in Europe. Any cosmetic or medical procedure always begins with a diagnosis. At the initial stage of professional activity requires not only a master of accuracy and painstaking, but also evaluation of absolutely all flaws and characteristics of the skin, so as not to miss a single step to eliminate them. All it requires is a beautiful view and perfect lighting. Lamp-magnifier. These devices combine the two functions - the function of a magnifying glass with an increase sufficient to quality diagnosis and function with a powerful illuminator shadowless light source close to the natural. This combination of properties makes it possible to perform high quality work and does not cause the quick eye fatigue. 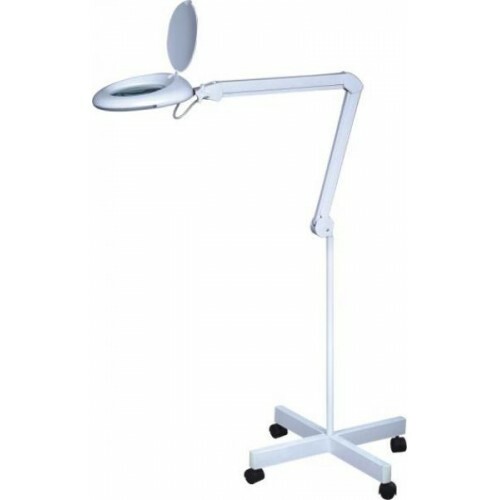 The lamp is equipped with a metal clamp for attaching to the table or cosmetic trolley and mobile stand-stable tripod, which enables to adjust the height of the illuminator widely.